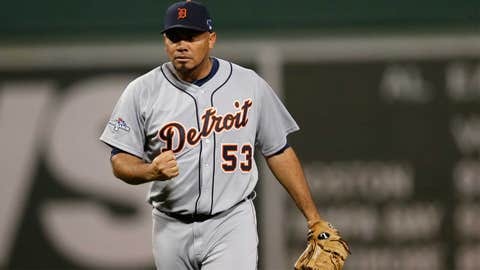 Former Detroit Tigers pitcher Joaquin Benoit (53) pumps his fist after getting to Boston Red Sox shortstop Xander Bogaerts (not pictured) to hit a fly out during the ninth inning in game one of the American League Championship Series baseball game at Fenway Park. The Detroit Tigers won 1-0. SAN DIEGO - The San Diego Padres today announced that they have officially signed right-handed pitcher Joaquin Benoit to a two-year Major League contract through the 2015 season with a vesting option for 2016. In addition, the club has designated right-handed pitcher Adys Portillo for assignment. Executive Vice President/General Manager Josh Byrnes made the announcements. "Joaquin has proven to be one of the top late-game relievers in baseball," said Byrnes. "We are excited to add him to our staff." "The Padres are a team that’s going up," said Benoit. "This is a (club) that’s looking to go to the playoffs and that’s what it’s all about. The bullpen has a lot of good arms and for me to join that (group), it was an easy decision." Joaquin Benoit (Wah-KEEN Ben-WAH), 36, went 4-1 with 24 saves in 26 chances, a 2.01 ERA (15 ER, 67.0 IP), 73 strikeouts against 22 walks and a .197 (47-for-238) opponent batting average in 66 relief appearances for the Detroit Tigers this past season. Over the last four years since 2010, the right-hander has gone 14-9 with 29 saves, a 2.53 ERA (73 ER, 259.1 IP), 295 strikeouts against 72 walks and a .200 (183-for-917) opponent batting average. Among relievers with at least 250 innings pitched since 2010, his 2.53 ERA is the fourth-best in baseball. A native of the Dominican Republic, Benoit originally signed as a non-drafted free agent by the Texas Rangers on May 20, 1996. Over parts of 12 Major League seasons with the Rangers (2001-08), Tampa Bay Rays (2010) and Tigers (2011-13), the 6-foot-3, 220-pound right-hander has compiled a 44-35 record with 37 saves, a 4.11 ERA (388 ER, 850.2 IP) and 833 strikeouts against 354 walks in 541 games, 55 starts. Over his 486 career relief appearances, he is 30-16 with a 3.17 ERA (203 ER, 576.0 IP), with 600 strikeouts against 217 walks and a .211 (442-for-2099) opponent batting average. Portillo, 22, went 0-1 with a 4.82 ERA (5 ER, 9.1 IP) and 10 strikeouts against four walks over three starts for Single-A Fort Wayne in 2013. The right-hander was originally signed by the Padres as a non-drafted free agent on July 2, 2008. Over parts of five minor league seasons in the Padres organization, he compiled a 14-38 record with a 4.86 ERA (181 ER, 335.0 IP) and 321 strikeouts against 198 walks in 80 games, 75 starts. With today’s transactions, the Padres currently have a full 40-man roster.